MAKES 12 (8-INCH) CREPES Usually paired with savory cheeses and meats (or caviar and crème fraîche!) 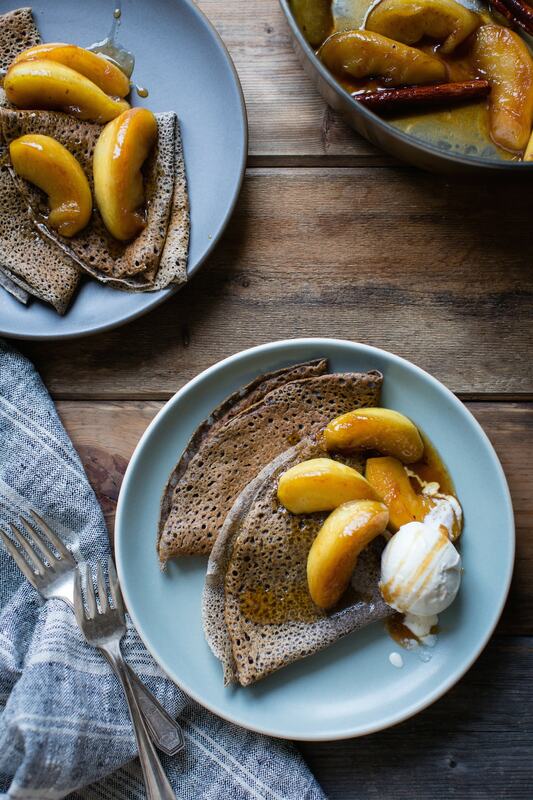 in Northern France, these crepes by Bojon Gourmet Alanna Taylor-Tobin are delicious smothered in tangy-sweet cider-glazed apples, with or without yogurt or ice cream. For painless crepe making, it helps to have a small offset metal spatula as well as a thin metal spatula and a crepe pan. But whatever you have in your kitchen will work. Layered between parchment or wax paper in an airtight container and refrigerated, the crepes will keep for up to 3 days. Make the filling: Quarter and core the apples, then halve lengthwise into wedges. In a wide heavy-bottomed skillet over medium heat, melt 2 tablespoons of the butter. Add half of the apple wedges in a single layer and cook until golden, about 3 minutes. Cook on the other side until golden and beginning to soften but still holding their shape, about 3 minutes longer, and gently transfer to a plate. Repeat with the remaining apples and butter. In the same pan, carefully add the cider (it will splatter), maple syrup, cinnamon, cloves, and salt. Bring to a simmer over medium heat and cook, swirling the pan occasionally, until the syrup bubbles thickly, 10 to 20 minutes. Return the cooked apples to the pan, tossing to coat them in the syrup, and simmer to glaze the apples, 3 to 5 minutes longer. Keep warm. Meanwhile, make the batter: In a blender, combine the eggs, milk, maple syrup, buckwheat flour, sweet white rice flour, and salt. Blend on low to combine, scraping down the sides of the blender as needed. With the motor running, add the melted butter. Pour the batter into a measuring pitcher or bowl. Heat an 8-inch crepe pan or skillet over medium heat. Use a heatproof pastry brush or a scrunched-up paper towel to swipe the pan with a tiny bit of oil (too much will cause the batter to slip as you swirl to coat the pan). Pour 1/4 cup batter into the crepe pan, then tilt and swirl to coat it evenly with a thin layer of batter. Cook until just set on top and golden on the bottom, 30 to 60 seconds. Use a thin metal spatula to ease the crepe’s edges up off the pan, then flip it over to cook on the other side, 30 seconds longer. Repeat to make the remaining crepes, stirring the batter occasionally, swiping the pan with oil in between crepes, and adjusting the heat as needed so the crepes don’t burn. To serve, rewarm each crepe briefly in a hot, buttered skillet (if desired). Fold into quarters with the pretty side up and slide the crepe onto a plate. Divide the crepes among 4 plates and top with the glazed apples, a drizzle of the apple-glaze syrup, and a scoop of yogurt or ice cream.